I am a fan of the short story. I read them. I write them. I have no doubt they are here to stay and will continue to be published. I don’t buy into the idea that the short form is an endangered species, and here’s why. In our busy twenty-first century lives, the short story is just the right length to fit into those brief moments when we stop and catch our breath between our daily responsibilities. The short story, regardless of whether it is five hundred or five thousand words long, can slot comfortably into these spaces. We all like to finish things, and being able to start and finish a story in one sitting is satisfying. Where a novel takes an extended commitment of concentration and time, the short story asks much less of you, yet offers so much in return. Done well, a short story will grab you by the scruff of the neck and press you hard up against life, in all its beauty and ugliness. Andy Kissane’s collection, The Swarm, did just that. The opening story, “In My Arms”, deals with the loss of a child – the most painful grief imaginable – yet there is light and hope at the conclusion of the story. By cleverly linking the first and last stories, Kissane brings the reader full circle, creating a feeling of completion. The last story, “A Mirror to the World”, stayed with me long after I had read the final sentence and closed the book. “In My Arms” was equally as affecting, though in a different way, as if it had taken an alternate route to my heart. Both stories are filled with sadness and loss, with some of the worst experiences the world can present to us. The actions and reactions of the characters are to be expected given the situations they have been written into. One difference I felt between the two stories was the way I read them, the way I felt while reading them. With “In My Arms”, I had the sense of looking down and watching the events unfold, of being ‘apart from’, rather than ‘immersed in’, the story. A detached observer, though the sadness still reached me. The opposite was true of “A Mirror to the World” – which is what most writers do with their writing; show the reader a reflection of the world around them. I experienced this story more closely, intimately. This may, in part, have been the form the story took, which was a writer (Kissane) writing about a writer, writing. This can be tedious when done badly or for no real reason, but I felt Kissane knew exactly what he was doing. By structuring the story in this way, he has helped the reader take it in less quickly. By slowing us down, he has allowed us to digest the tragedy in bites, rather than choke on its intensity. The difference in the way I experienced these two particular stories could simply have been the order in which I read them. When I read the first story, Kissane was a author that was new to me. By the last story, I was more familiar with the writer and his style; this may explain why I felt more immersed in the final story of the collection. Also, knowing the book was coming to an end, perhaps I wanted to savour that final story, like the last spoonful of desert at the end of a good meal. The character M. Chagall in “The Illusive Tenant” was particularly interesting to me. Though he was not a major player in the story, the front story at least, he plays such a large part within the context of it. His surrealist art leaches out into the fabric of the story until the story itself becomes a written version of surrealism. It was surprising and entertaining. For me, this story stood on its own, spot lit, within the collection. Kissane’s stories are not complex or filled with action and movement, but each satisfies in its own way. They encourage the reader to participate, imagining what lies outside the confines of the words on the page. As Samuel Johnson once said, “A writer only begins a book. A reader finishes it”. I’m glad I had the opportunity to read The Swarm and become familiar with this writer’s work. There is a skill to writing a good short story. Every word must count; must earn its right to be there. Kissane clearly knows this. There is nothing superfluous here. 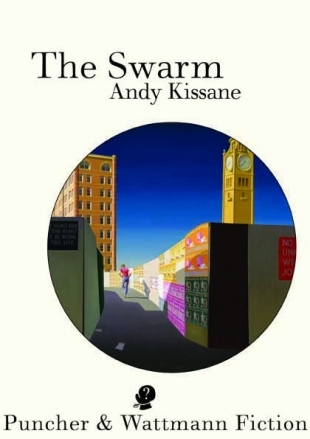 This entry was posted in Andy Kissane, Issue 9, Lisa Wardle, Puncher & Wattmann, The Swarm and tagged Andy Kissane, Australian Fiction, Australian Literature, Australian short fiction, Marc Chagall by Mark Roberts. Bookmark the permalink.